|Bond to Literacy is a 12-week early literacy program designed for families who are experiencing more acute turmoil in their day-to-day lives. 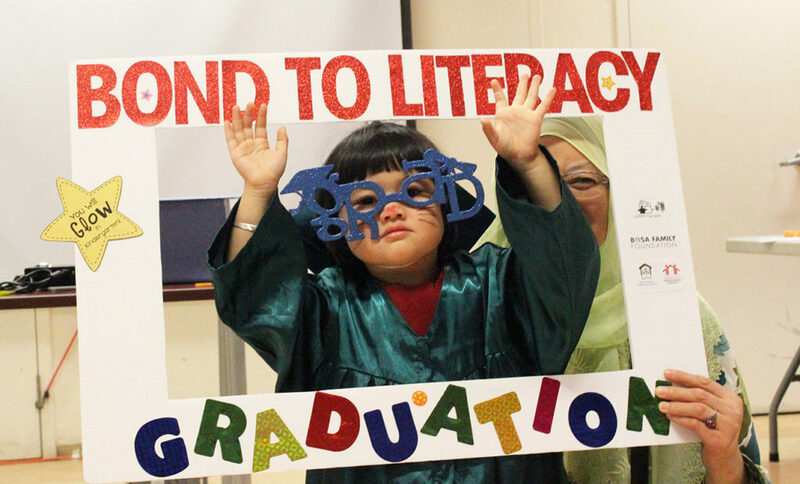 Bond to Literacy is a 12-week early literacy program adapted from the HIPPY program for low-income, disadvantaged families who struggle with issues that may prevent them from making a long-term commitment. The program is designed to demand less on families while still providing tools and support for parent-child engagement, improved literacy, and school readiness. Using HIPPY’s proven model of peer-to-peer program delivery, Community Facilitators are hired from the local community. The Facilitators lead weekly group meetings for parents where the HIPPY curriculum is taught to them using the role-play method of instruction. Parents then take these new skills home and work with their children each day – returning to the group the following week to share their successes and challenges and support each other through the process. Parents work daily with their children, reading and carrying out the fun activities provided. They develop a habit of reading, playing and sitting together with their child, which lays the foundation for a new, lasting pattern of parent-child time.